WASHINGTON (Reuters) - U.S. labor costs in the second quarter recorded their smallest increase in 33 years as workers earned less in commissions and bonuses, in what appeared to be a temporary wage growth setback against the backdrop of diminishing labor market slack. The surprisingly smaller rise reported by the Labor Department on Friday did little to temper expectations that the Federal Reserve is set to raise interest rates later this year. The job market is fast approaching full employment. "Labor market fundamentals are improving, job openings are at record highs, and slack on a steady downtrend. This is precisely how the Fed will interpret this report, even if the numbers here are atrocious," said Eric Green, chief economist at TD Securities in New York. The Employment Cost Index, the broadest measure of labor costs, edged up 0.2 percent in the second quarter, the Labor Department said. That was the smallest gain since the series started in the second quarter of 1982 and followed a 0.7 percent rise in the first quarter. The weakness in compensation was concentrated in sales, information and wholesale trade, occupations where workers are likely to receive incentive pay. Commissions and bonuses helped lift worker compensation at the start of the year. Excluding commissions, compensation was up 0.6 percent in both the first and second quarters, according to TD Securities. Economists had forecast the employment cost index, widely viewed by policymakers and economists as one of the better measures of labor market slack, rising 0.6 percent in the second quarter. At 5.3 percent, the unemployment rate is close to the 5.0 percent to 5.2 percent range that most Fed officials consider consistent with full employment. That tightening of the labor market, which is expected to eventually translate into faster wage growth, has helped to hold consumer sentiment at lofty levels over the past eight months. In a separate report, the University of Michigan's consumer sentiment index slipped to 93.1 in July from 96.1 in June. Still, the index was up 13.8 percent compared to July of last year. Households expected their incomes to rise over the next two years, in sharp contrast with another confidence survey published earlier this week that had suggested a deterioration in consumers' perceptions of the labor market. "On balance, the Michigan survey suggests that consumer sentiment remains broadly stable," said Jesse Hurwitz, an economist at Barclays in New York. Stocks on Wall Street were marginally higher, while the dollar fell against a basket of currencies. Prices for longer-dated U.S. Treasury debt rose. In the second quarter, wages and salaries, which account for 70 percent of employment costs, rose 0.2 percent. That was also the smallest increase on record and followed a 0.7 percent increase in the first quarter. Private sector compensation failed to rise for the first time on record. Compensation in the services sector nudged up 0.1 percent in the second quarter after rising 0.6 percent in the prior period. Compensation in the goods producing sector rose a solid 0.7 percent after increasing 0.5 percent in the first quarter. "If we took this as a sign of things to come in the labor market, we might have to rethink the timing and pace of Fed rate hikes. However, this report seems to be out of tune with other indicators and anecdotal evidence," said John Ryding, chief economist at RDQ Economics in New York. In the 12 months through June, labor costs rose 2.0 percent, the smallest 12-month increase since last year and a further slip below the 3 percent threshold that economists say is needed to bring inflation closer to the Fed's 2 percent medium-term target. Benefits rose 0.1 percent in the second quarter, but economists said that was mostly because of changes to the definition of retirement benefits. A third report from MNI Chicago showed factory activity in the Midwest jumped to a six-month high in July. The Chicago Business Barometer rose to 54.7, the first gain since April, from June's reading of 49.4. 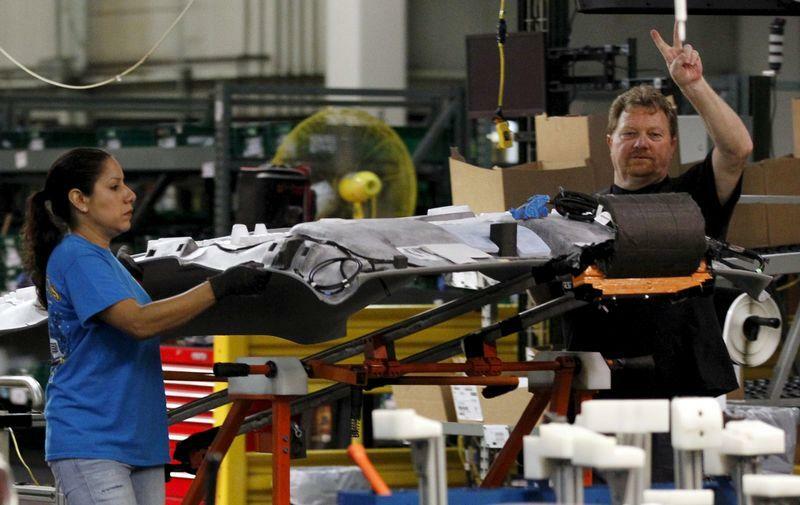 A reading above 50 indicates expansion in the region's manufacturing sector. Both production and new orders expanded at the fastest pace since the beginning of the year. A special survey question on wage growth showed that 40 percent of respondents said wages had grown by 1 percent to 2 percent over the past year. About 19 percent of respondents reported wages were up 3 percent to 4 percent and nearly a quarter said that wage growth was unchanged over the year.